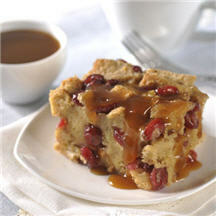 A traditional pudding, with a twist of dried cranberries, for holidays...or any day. Grease 12 x 8-inch baking dish. Bake for 35 to 45 minutes or until knife inserted in center comes out clean. Top with warm caramel sauce.